Action from Campsie Minerva's League Cup Final with Colville Park (pic by John Rodger). Campsie Minerva’s hopes of lifting the Bunrigh League Cup trophy fell at the final hurdle at Lesser Hampden on Wednesday night. However they staged a fine comeback to maintain their unbeaten league record with a draw at Cambusnethan Talbot while rivals Harestanes also kept their title bid on track with victory over Southside. Minerva went down 3-0 to Foster’s Central Scottish Premier Division rivals Colville Park in a League Cup Final match which attracted a healthy crowd of around 300. Minerva manager Grant McKie had to reshuffle the pack due to regular Andrew Graham being cup tied but Grant Lightbody would endeavour to be an able deputy. Colville too were missing talismanic striker, and Kirky lad Paul McLaughlin, who was missing due to a weekend knock. The final was a cagey affair to start with. Tommy Neil was having a positive start in midfield and was linking well with Stuart Tullis up front for Minerva, but after 15 minutes both teams had still failed to carve out a half decent opening. However Colville began to take a firm grip on the game and Kevin Fotheringham tried to lob Brendan Shaw from 10 yards but the effort went over. Blair Findlay replied immediately for Minerva with a long range effort handled well by David Tait, but right away Colville were again on the offensive and James Mulvey’s speculative shot came back off the Minerva bar. On 30 minutes Shaw saved well from Fotheringham, who really should have done better when he found himself alone from 10 yards out with only the keeper to beat. Three minutes later Darren Miller sprang the offside trap but fired his shot over Shaw’s goal, definitely a let off for Minerva. The Motherwell team continued to press and really should have gone ahead when Fotheringham was once again thwarted by the inspired Shaw in the Minerva goal. Minerva were fortunate to get in at the break on level terms, but carved out their first good chance early in the second half. After great work on the left Tullis swung over a cross but Johnny Reid just failed to connect. However the deadlock was broken by Colville with 10 minutes played in the second half when a good cross from Fotheringham was met by Christopher Craig who headed past Shaw from three yards. Sadly for Minerva, from then on it was pretty much one way traffic. With 26 minutes to go Colville increased their lead; this time the Minerva back four were caught flat footed and Fotheringham nipped in to net from six yards out. Six minutes later Colville wrapped it up when Reid lost possession in the middle of the park and man-of-the-match Miller pounced to score past Shaw from 20 yards and put the final out of reach for Minerva. Minerva travelled to South Lanarkshire on Saturday for a Premier League clash with Cambusnethan Talbot looking to arrest the recent slide in form that has seen them exit the West of Scotland Cup, Scottish Cup and lose the Bunrigh League Cup final. They made a positive start and within the first two minutes Tom Neil had a strike from 25 yards saved well by Mick Jones. A good run by Neil then put Jamie Pollock through but he pulled the shot wide from 10 yards. But on 10 minutes the home side found their feet. Nicky Headon picked up the ball on the left and passed to John Mellor who put it in the back of the net from three yards to put Cambusnethan 1-0 up against the run of play. Neil almost relied immediately, forcing a good one handed save from Jones, and Los Frame then saw a shot well saved as the keeper turned it round the post. Reid then missed the target with a header from the resulting corner. Despite the plethora of chances afforded to Minerva they remained a goal down and the home side came back into the game. For the remainder of the first half the Minerva goal led a charmed life until two minutes from the break. Andy Graham found himself unable to clear his lines in the Minerva defence and a fortunate break of the ball fell kindly to Paul Simonon who finished from close range. Minerva needed an improved performance in the second half if they were to preserve their unbeaten league record and maintain their aspirations of a title challenge. But just five minutes after the restart Bernard Rhodes, despite claims for offside, found the net for the home side after a good initial stop from Barr in the Minerva goal. With 40 minutes to go and 3-0 down away from home it did not look good for the Campsie side. But on the hour they were won a penalty after good work inside the box by Johnny Reid. Pollock’s effort was saved but after some pinball inside the box the ball fell to Minerva substitute Johnny McWilliams who slotted home from 10 yards. Minerva now had something to aim for and McWilliams once again came to the fore with 15 minutes to go he latched on to a good through ball from Tommy Neil and scored past a despairing keeper with aplomb. Almost immediately Mickey Boyle could and should have equalised but was denied by a great save from Jones. But McWilliams then capped off a great second half performance by netting his hat-trick and Minerva’s equaliser after some good work by Frame. 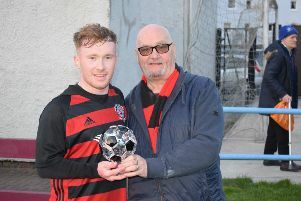 The home side could still have won it as a speculative 30-yard shot from Johnny McLehaney came back off the Minerva bar, but Minerva’s second-half some steel and gritty determination was rewarded with a point. Harestanes continued their quest for the Foster's Central Scottish Premier Division title with a satisfying 3-1 victory against a strong Southside team. There was little between the sides in the first half. Neither established clear dominance, play was even and raged from end to end. Southside created the first real chance from a free-kick. O’Boyle turned the ball away from goal, a shot was tried from an acute angle, the ball was blocked out for a corner. From the corner they carved another attempt but shot wide. Harestanes took the lead with a neat goal from Johnny Black. A long ball was pumped up, Blair Munn head it back for Jamie Broadfoot and he played it through the defenders for Black to beat offside and curl a low ball beyond the keeper and into the right corner. Black and Broadfoot again linked up to give Black another chance, unfortunately his attempt was blocked. Kevin Welsh then set up another chance with a low ball across the front of the goal, but there was no-one there for Harestanes to take advantage. In the 33rd minute, a turn a shot by Black pulled a good save out of the keeper and as the first half drew to a conclusion, while Harestanes had the lead the game was still there for either to win. The second half was a different story as Harestanes rose to dominate and outplay Southside. They went further ahead following neat and determined play by McCormick on the corner line. He fought his way past the full-back and crossed low for Malcolm McLean to flick in at the near post. Munn then made it 3-0 with a 25-yarder which he drove low into the left corner, taking everyone by surprise. Southside pulled one back at the death with a header, but too little, too late. Harestanes Tote: no winner, £200 rollover. Lenzie’s under-17s came from two down to earn a 2-2 draw in their CKDYL match with Motherwell ITC. With the visitors’ pitch unplayable, the match was switched to Boghead during the week. Both teams had early chances but it was Well who went in front with a shot from 12 yards. Craig Douglas then hit the bar with a great shot before the visitors scored their second from close range. However Lenzie pressed forward and, following a Thomson corner, Inglis drove the ball low under the keeper from eight yards. The second half had the home side in control with Well dangerous on the break and a great move between McMahon and Inglis allowed striker Royle to burst into the box, beat his marker and curl a great left foot shot high past the advancing keeper to make it 2-2. Special thanks go to R Wilson Decorators Kirky for sponsoring Lenzie’s Adidas kit and Craig Rodger from Homes Book for the match ball. Lenzie's 2002 defeated Holytown Colts 5-3 in a Regional Cup fourth round encounter. Lenzie got off to a great start, going into a two goal lead through Ewan Stevenson and a Lewis Crawford penalty. They added a third with a good Lewis Gargano finish, but then got sloppy and just on half-time Colts got a goal back. Lenzie increased their lead through Gargano at the beginning of the second period, but Colts got back in it with two quick goals to bring the game to 4-3. Lenzie were under pressure, but held on with resolute defending from Matt Gunn and Ben Street and another Ewan Stevenson goal then settled Lenzie and secured a good win against a strong opposition.